You might love whole grains and leafy greens, but your kids are more excited for a McDonald’s Happy Meal. Getting your preschooler to show the same enthusiasm for healthy foods can be tricky. 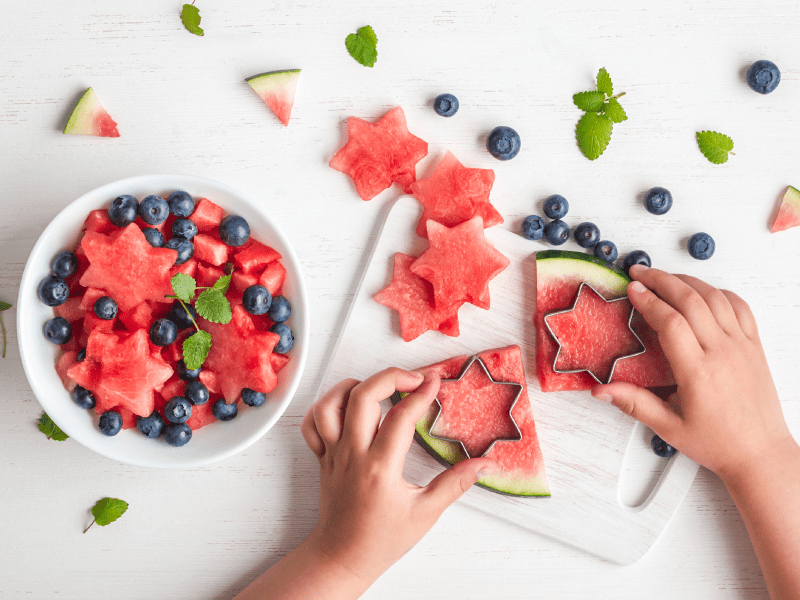 To encourage a well-balanced diet in young kids, here are 3 healthy eating activities for preschoolers. Make it finger-food friendly: Your child might not be a fan of eating their whole dinner, but perhaps they always devour their snacks. While snacks are fun (we love them, too), they don’t have the complete nutrition a balanced meal does. Our suggestion? Turn their meal into finger foods! Cut their sandwich into small pieces and choose fruits and veggies that are also cut up into small pieces, rather than a whole fruit. Breaking down their meal into bite-sized pieces makes it seem less intimidating, and promotes portion control. Finger foods make a meal appear like snacking, allowing you to sneak in all the nutrients that they need. Bento box-it-up: A bento box is perfect for school lunch. Popularized in Japan, these lunch containers can be metal or plastic and have different sized sections to hold different food items. They provide the perfect opportunity for variety in the meal while keeping portion sizes healthy. You can find bento boxes online for your child and for yourself! Need help building the perfect lunch that meets all the nutrient requirements? We’re all about healthy eating activities for preschoolers, kindergarteners or older kids! Check out our guide to the perfect school lunch. These are great ideas! I just switched to a new insurance provider through Insurance Line One (I found an amazing dr. and an affordable premium!) My dr. let me know that since my son is so picky he is on the low percentile for his weight and height. I will have to try the shapes idea to make lunch more fun! thanks! Thanks for reading, Jessica! Let us know how they work.